NOMEX® Aramid Paper – Imavolt S.A.
NOMEX paper is a synthetic paper, composed of short fibers (bars) and small binding fibrous particles (fibrins) from an aromatic polyamide (aramidic), a polymer which is high-temperature resistant. During the manufacturing process, longer fibers (bar) tend to go in the direction of paper which is coming out of the machine. But there is a marked difference among the mechanical properties of NOMEX paper in machine direction and in transverse direction, and these properties are always expressed for both directions. Both components are mixed in a water-based coating and are shaped as a continuous sheet by means of a machine which is quite large (density 0.3), with more than medium mechanical and electrical properties. It can be used in some applications in which a soft malleable material or one with impregnation properties is needed. 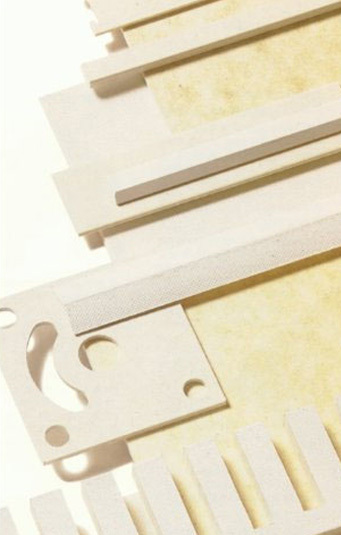 Densification and internal binding are achieved by heating it at high temperatures, thus producing a mechanical resistant, flexible paper, with good electrical properties up to 220ºC. All types of NOMEX are sold in 610mm and 914mm roles (type 411) and in 4mm onwards wide strips. Several thicknesses of up to 0.76mm can be obtained. NOMEX 410 has been approved by Underwriters Laboratories for continual use as electrical insulator at 22ºC. Classification of flammability test is 94V-0, which means that this is a self-extinguishing, non-dripping material, and that no test tubes from a certain batch burn for more than ten seconds after having separated them from the ignition source in the vertical flame test. No flammability of NOMEX paper has motivated its adoption in cases in which there is a great fire risk. Limit oxygen index ranges from 0.27 to 0.28. As NOMEX does not melt, it can resist short exposures to temperatures higher than 300ºC, with only minimal reductions of its electrical and mechanical properties. From 400ºC onwards, NOMEX starts degrading. Intensive tests in motorette systems according to IEEE 117 have shown that NOMEX paper is compatible with resins, wire enamels and electrical varnishes of phenolic, polyester, epoxy-based, polyamidic and silicone materials. Dielectric strength of all calendering NOMEX papers is high compared to the one of many other fibrous insulating materials (e.g. asbestos paper 3/5 Kv/mm, pressboard 19/15 kv/mm), and it is more suitable to resist electrical voltage generally found in electrical appliances (approx. 2 kv/mm). Even at 250ºC, NOMEX keeps almost 95% of its value at room temperature. Dielectric strength and dissipation factor at 1 Khz are low at room temperatures, and they only slightly rise to 225ºC. NOMEX volumetric and surface resistivity exceed 1016 OHM cm at room temperature. These values drop when temperature rises, as it is shown in the following figure; however, even at 250ºC they still exceed 1012 OHM cm. types of NOMEX paper at 50% relative humidity. This ternary composite material is subjected to impregnation with modified epoxy resin and taken to B-stage polymerization which under pressure and temperature conforms a hard product. After-polymerization resin has good adhesion to copper. It is used for general insulation of slots and inter-phase rotors and stators, it can be molded under pressure and temperature to conform any type of required geometrical figure. It is composed of aramid paper (Nomex® 410) impregnated on both faces with B-stage modified epoxy resin, which under pressure and temperature conforms a hard product. After-polymerization resin has good adhesion to copper, permitting the creation of class F insulations. It is suitable for insulation between field coil winding layers of rotating machines. Unit: 610mm and 910mm wide coils. Weight: 35 and 55kg respectively. Note: It is cut in rolls of customized widths.